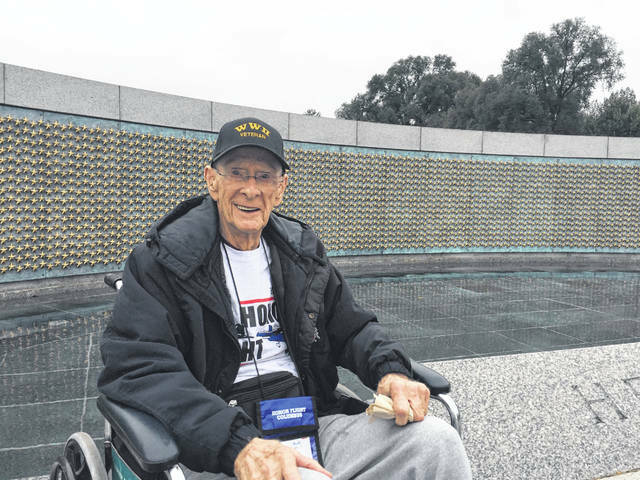 Delaware resident and World War II veteran Lee Siegwald is pictured in front of the 4,048 gold stars on display at the World War II Memorial in Washington, D.C. Each star represents 100 American military deaths during WWII. 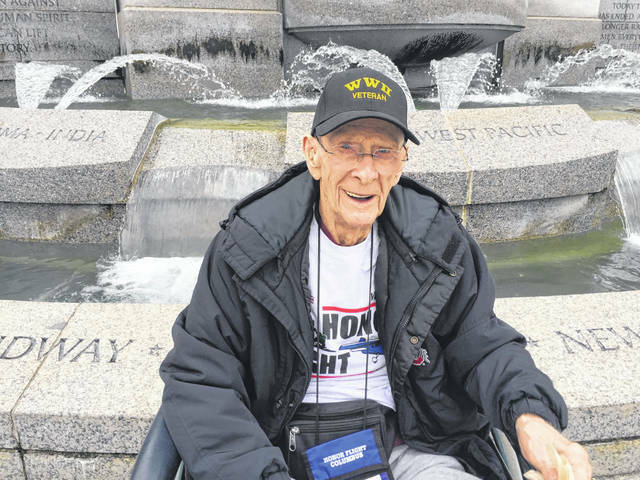 Siegwald recently visited the nation’s capital thanks to Honor Flight Columbus. This picture was taken of Siegwald during his time in the service. A veteran of the U.S. Army, Siegwald served during World War II. 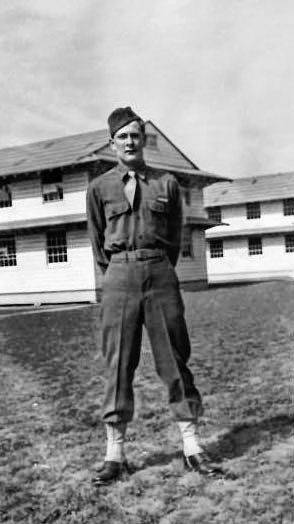 This picture of Siegwald was snapped while he was serving his country in the U.S. Army during World War II. During his recent trip to Washington, D.C., Siegwald posed for several pictures at the World War II Memorial. When longtime news anchor Tom Brokaw famously coined the term “Greatest Generation” to describe the men and women of the United States who grew up during the Great Depression and helped the Allies save the world during World War II, he was referring to Americans like Delaware resident Lee Siegwald. At the ripe old age of 95, Siegwald isn’t shy about sharing his life story with anyone willing to sit down and visit with him at Willow Brook Christian Village. Those memories, like many others of the “Greatest Generation,” include challenging economic times, marrying his high school sweetheart and raising a family, serving his country abroad, and growing old in a country he loves and was willing to die protecting. “I’m just built differently,” Siegwald said. Born and raised in Circleville, Siegwald had just graduated from high school when he decided it was time to face a new challenge — enlisting in the military with hopes of becoming a pilot, but not just any pilot. Siegwald didn’t have to wait long to get the call to serve his country as a year later on Jan. 8, 1943 — his 20th birthday — he was drafted into the U.S. Army, an opportunity he relished, despite knowing there was a chance he could lose his life on a battlefield in some distant land. “Here’s the big deal and most people nowadays won’t understand this, but the culture of this country was different in 1941,” Siegwald said. “When we declared war, it was like the whole country said that is okay, that is what we will do, and we will be behind it. “We didn’t have people socking one another in the face or shooting one another. It was a combined great cultural feeling of we will unite and get this done. I’m trying to purvey that to the generations to come, because we are not there today like that,” he said. Siegwald added he isn’t “too happy with what is going on” in the country right now, but giving up on his country and fellow Americans isn’t something he’s willing to do. When asked about his time in the U.S. Army, Siegwald said he was, among other things, a drill sergeant. To this day, he said it was a role he was born to do. While some of his fondest memories were those days spent as a drill sergeant, Siegwald and many others at that time were focused on one main goal — helping the Allied Powers win the war. With that in mind, Siegwald made the decision to go to Officer Candidate School (OCS), which led him to becoming part of the U.S. Army Ordnance Department. For those unfamiliar with this particular department, Siegwald said that’s understandable. Siegwald soon found out the importance of the Army Ordnance Department as he found himself helping troops battle the Axis Powers in the Philippines. For instance, Siegwald said while on the ground, airplanes would drop numerous supply boxes in a particular area. Thanks to a complex identification system ran by the ordnance department, the supplies made it to the correct divisions. “If the engineers, air force or infantry needed ammunition, they didn’t have to break down a thousand crates looking for it,” he said. Thanks to Siegwald and his crew, troops on the ground knew where to go to get the essentials they needed, assuming they had the proper clearance. “You had to order it,” he said. “You couldn’t go and pick a gun out of the warehouse. You had to write a requisition, and a captain had to sign it and all that crap. Same crap in the Army as it is in the civilian life. “I have a code that I did go by in the Army: ‘I’ve never seen so much inefficiency so well organized.’ That’s the ordnance department,” he added. 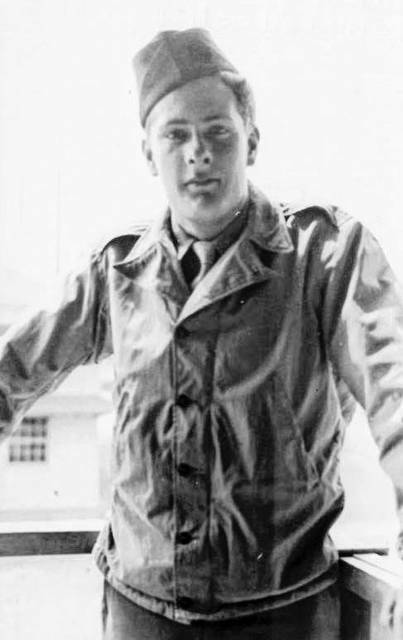 When recalling some of the unforgettable moments he experienced while serving his country in places like New Guinea, the Philippines, and Japan during World War II, Siegwald said while he was shot at from time to time, he never had to dodge “machine-gun fire” like many of his fellow countrymen. He did, however, have a few hair-raising situations, including a freak accident onboard a ship and walking away from a two-story fall. Siegwald vividly described an incident that occurred while he was onboard a large ship in the Admiralty Islands with 2,000 to 3,000 other servicemen. While the ship was resting in a bay, Siegwald and the others were treated to a “beautiful buzz job by an American pilot who was simply showing off, which didn’t set well with the ship’s commander. After two to three passes, that’s exactly what happened. Siegwald said the impact killed not only both men in the plane, but 13 Navy men sleeping on the ship. He added it was pure luck that only a dozen-plus men were killed that day. Had the plane crashed just feet higher, the death toll would have included many men, Siegwald one of them. “You can’t imagine what people did to show off. It’s unbelievable,” Siegwald said. While he dodged injury during the aircraft mishap, the same can’t be said about an incident that occurred while Siegwald was with his crew in Manila, Philippines. In search of a building to house all the ordnance department equipment, the group can upon a bombed out old shoe factory. Fortunately for Siegwald, someone was looking out for him that day. While Siegwald is thankful he survived his time overseas during WWII, he will never forget the men who didn’t make it back, some of which he knew personally. Like so many men of his generation, Delaware resident Lee Siegwald returned home from the war and sought to live his own American dream. For Siegwald, that was spending time with his wife, raising children, and working hard for everything he had. It wasn’t an easy transition from military life to civilian life for Siegwald, who returned to Ohio to a life with his high school sweetheart, Mary Ruth, whom he married while he was in the service. “We were married on Feb. 19, 1944, in a chapel on the Army post in Aberdeen, Maryland, while I was a drill sergeant,” Siegwald said. Once he returned to the States, finding a job was difficult, so he decided to put his G.I. Bill to use. The Ohio State University was his first choice, but the experience was one Siegwald wishes would have gone a different way. Siegwald said when he enrolled, class sizes were in the hundreds, which made it difficult for students and the university to make schedules work. “I tried to get a schedule to fit what I needed to do, which was get a job since I had a child on the way,” he said. Siegwald said at that time in his life, he was hitch-hiking from Circleville to Columbus and really needed a class schedule that didn’t include Saturday classes as that would have cut into his work hours. With OSU out of the picture, Siegwald turned to Franklin University, where he received a degree in architectural drafting. With degree in hand, the family moved from Circleville to Dominion Boulevard in Columbus, where Siegwald would remain for 73 years until moving in May to Willow Brook Christian Village in Delaware. While living in Columbus, Siegwald worked as a carpenter and a jack-of-all-trades before entering the building business. As for what he considers his most important job — being a family man — Siegwald and his wife raised five children before she passed away from breast cancer in 1985 at the age of 65. Still “angry” at the disease that took his beloved wife, Siegwald is hopeful a cure will one day be found that might save the life of someone in his family, which includes 12 grandchildren and a number of great-grandchildren. “They all know who the patriarch is,” Siegwald said with a chuckle. No matter what the rest of his life has in store, Siegwald said he’s thankful for the first 95 years of his life, a life that included his generation rising up in the face of adversity. By the grace of God, Siegwald added, his life was spared during WWII, allowing him to spend four decades with his wife, raise five kids, and spend time with his grandchildren and great-grandchildren. Contact Joshua Keeran at 740-413-0900. Like The Delaware Gazette on Facebook.